OXON HILL, Md. 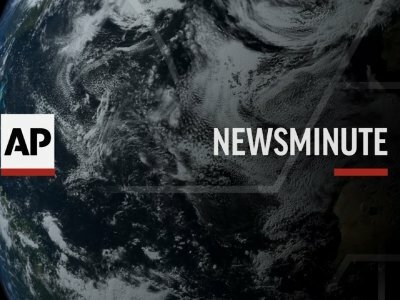 (AP) — In a story June 1 about the Scripps National Spelling Bee, The Associated Press reported erroneously that Jashun Paluru finished fourth. He finished in a tie for third. This week's images include the Scripps National Spelling Bee, the French Open tennis tournament and a fashion show in Chantilly, north of Paris. OXON HILL, Md. (AP) — Karthik Nemmani didn't win his regional spelling bee. He didn't even win his county spelling bee. But he was still good enough to win the Scripps National Spelling Bee. Throwing everything he had into his one shot at glory, 14-year-old Karthik outlasted better-known spellers on Thursday night and became the champion after a dramatically abrupt end to the competition, when 12-year-old Naysa Modi misspelled the word "Bewusstseinslage" in the first championship round. OXON HILL, Md. (AP) — Competitors in the Scripps National Spelling Bee often struggle to contain their emotions as they react to obscure, complicated or tricked-up words that they may have never heard before. Not knowing a word doesn't always mean a speller will get it wrong — the savviest competitors can piece together a word by relying on their knowledge of roots and language patterns. Fourteen-year-old Karthik Nemmani of McKinney, Texas, has won the Scripps National Spelling Bee. Karthik spelled the word "koinonia" correctly to become the champion late Thursday. He also spelled "haecceitas" correctly after seventh-grader Naysa Modi from Frisco, Texas, missed the word "Bewusstseinslage" in the final round. OXON HILL, Md. (AP) — For 15 years, the Rev. Brian Sietsema sat quietly next to Scripps National Spelling Bee pronouncer Jacques Bailly, just in case the indefatigable Bailly was somehow unable to fulfill his duties. Bailly never missed a word. But this year, the bee nearly doubled in size thanks to a new wild-card program, and Bailly knew he could wreck his voice if he didn't take some breaks over three full days of spelling. Forty-one spellers have advanced to the finals of the Scripps National Spelling Bee out of a field of 516, by far the biggest in the 93-year history of the competition. The finalists were announced Wednesday after two days of onstage spelling during which nearly 200 spellers were eliminated for getting words wrong. Scores on a written spelling and vocabulary test determined who advanced to the finals. OXON HILL, Md. (AP) — This year's Scripps National Spelling Bee has drawn the largest number of competitors in its history, 516 spellers, but the field gets much smaller Wednesday with the announcement of the 50 or so spellers who will make Thursday's finals. WASHINGTON (AP) — There's little downtime for the dozen or so spellers who make it to the primetime finals of the Scripps National Spelling Bee. WASHINGTON (AP) — "Gargantuan" might be an appropriate word to kick off this year's Scripps National Spelling Bee. The competition will be super-sized because of a new wild-card program that provided a path to the bee for kids who didn't qualify by conventional means and were willing to pay their own way. Scripps was willing to allow the bee to nearly double in size, and that's exactly what happened: There will be 519 spellers in this year's bee, up from 291 last year. When Virginia Hogan was crowned national spelling champion in 1929, her Omaha schoolmates were so impressed that they reportedly stopped class to break out in song. When Jennifer Reinke came home in 1967 a national champion, she was given a key to the city of Omaha and a motorcade escorted her to her hometown of Deshler. BISMARCK, N.D. (AP) — A Fargo eighth-grader will represent North Dakota in the Scripps National Spelling Bee in Washington, D.C., in late May. Tobi Shorunke from Ben Franklin Middle School outlasted dozens of other spellers to win the state bee on Monday in Bismarck. Shorunke correctly spelled "millibars" to win the bee in the 14th round. It took over three hours of spelling encompassing 15 rounds of words, and when it was over, a Santa Fe sixth-grader emerged as this year’s winner of the New Mexico Spelling Bee on Saturday. According to several news sources, including the Albuquerque Journal, Akansha Nanda, 11, a student at Carlos Gilbert Elementary School, bested 45 competitors by correctly spelling “Mozambique” — a traditional lightweight African fabric named after the East African country of the same name. MOUNT VERNON — Charity Jordan is headed back to the national spelling bee. The La Conner Middle School eighth-grader won her third consecutive title Saturday morning at the 2018 Skagit Regional Spelling Bee. “It feels surreal, I think,” Charity said after finishing first in a field of 30 elementary and middle school spellers at Skagit Valley College’s Phillip Tarro Theatre. Charity’s father Bill Jordan jumped to his feet, hollering and applauding, when his daughter won. Rebekah Zeigler, 12, is the four-time reigning Regional Spelling Bee Champion and will represent the Sauk Valley at the Scripp’s National Spelling Bee in Washington, D.C. on May 27. She is a seventh-grade student at Aplington Middle School in Polo. Her parents are Alissa and Mark, and she has a sister Nichole, 16, a sophomore at Polo High School, and a brother Gage, 11, a fifth-grader at Centennial Elementary in Polo. BILLINGS, Mont. (AP) — A Park County eighth-grader has repeated as Treasure State Spelling Bee champion. Aidan Veress of Gardiner School correctly spelled "Talmud" on Saturday to win the spelling bee for the second year in a row. He will once again represent Montana in the Scripps National Spelling Bee in May. Aidan says it "feels really, really good" to win again and that he didn't feel as much pressure because he'd been through last year's contest. BOSTON (AP) — Expect a little cacophony, or something equally challenging, at Boston's 11th annual spelling bee. Saturday's event will test the city's best youth spellers in grades 4 through 7. The winner will advance to the Scripps National Spelling Bee — the nation's largest and longest-running such contest — in Washington in May. MALTA – It’s a good thing Genoa-Kingston Middle School eighth-grade student Bryanna Sonntag built up quite the repertoire of spelling knowledge over the past several months. After countless hours of studying, she sealed an all-expenses-paid trip to Washington, D.C., where she’ll compete in the Scripps National Spelling Bee in May, with that very 50-cent word: repertoire. 2018 Cuyahoga County Spelling Bee: Here are the words that sent the winner to D.C.
CLEVELAND, Ohio -- After 23 rounds, eighth-grader Daniela Danilova secured her trip to the 2018 Scripps National Spelling Bee by spelling the word "barukhzy," an ancient dog breed native to the near East. Daniela's first language isn't English. Her family moved here from Russia when she was 6. Community spelling bee champion Sophia Grierson is working hard to prepare for the Scripps National Spelling Bee in late May, and she even has a huge new dictionary for help. “I’m going to try to do two letter sections every week — probably 300 pages a week,” Sophia said, adding that she should finish the dictionary at that rate just about the time the national spelling bee begins in Washington, D.C.
Before the Iroquois-Kankakee Regional Spelling Bee began, contestants gathered backstage for last-minute preparation, jiggling their legs and twisting their hands nervously as they asked questions about things such as capitalization and hyphens. DIXON — At the Lee-Ogle-Whiteside Regional Spelling Bee, winner is spelled Z-E-I-G-L-E-R.
For a record-breaking fourth year in a row, Polo's Rebekah Zeigler earned a trip to the Scripps National Spelling Bee, May 29-31 in National Harbor, Maryland. The 12-year-old Aplington Middle School seventh-grader beat 37 other participants from three counties – including her little brother, Gage – to win the bee in 37 rounds Thursday morning in Dixon High School's Wiltz Auditorium. WANATAH – The winner of the 2018 La Porte County District Spelling Bee will be determined on Tuesday at 6:30 p.m. at Kesling Middle School, 306 E. 18th St., La Porte. Students from 25 area schools will go head to head as they compete to be named the La Porte County District spelling bee winner. The La Porte County District Spelling Bee is sponsored by Kankakee Valley REMC, a local electric utility cooperative. The top student spellers from across Aiken County will gather on stage at 7 p.m. Monday at the AECOM Center for the Performing Arts with even more motivation and incentive to win the county spelling bee than normal. For the first time, the student named Aiken County Spelling Bee champion automatically will earn a spot in the Scripps National Spelling Bee, to be held in February in Washington, D.C. In previous years, only regional winners advanced to the national competition. Geophagy means to consume earthly substances, and is usually practiced as a cultural tradition or to remedy mineral deficiency, according to Merriam-Webster.com. A word many have never heard of, 73-year-old former Lubbock resident David Nelson - a resident of Meyerland for the last 30 years - recites the spelling and definition effortlessly. In 1959, Nelson competed in the National Spelling Bee as an eighth-grader and placed 12th out of 70 after misspelling geophagy. FRESNO, Calif. (AP) — The winner of this year's Scripps National Spelling Bee is back home in Central California. Ananya Vinay arrived Thursday night at Fresno Yosemite International Airport, where she was greeted by dozens of friends and two large banners. The 12-year-old lives in Fresno. The Fresno Bee reports (http://bit.ly/2rdo1FC ) that U.S. Rep. Jim Costa introduced himself as her congressman. Google Trends released a map of the most misspelled words by state and the results are a little surprising. In the end, it was a bug that did in Katy's Raksheet Kota, who still managed to do his hometown proud in the 2017 Scripps National Spelling Bee. Held in Washington, D.C., from May 30-June 1, the eighth grader from Beckendorff Junior High School managed to make it all the way through to the 12th round before the word "oedemerid" tripped him up. Leading up his final word, he had correctly spelled words like "bienvenue"; "nepenthe"; "brachycerous"; and "bouchée," among others. Ananya Vinay showed little emotion as she plowed through word after mystifying word in the final rounds of the Scripps National Spelling Bee. Later, as she stood beside the confetti-covered stage, the newly crowned champion flashed a toothy grin as she inadvertently revealed how much confidence she'd brought to the competition. Comic to hold a press conference to discuss fallout from photo in which she held a likeness of President Donald Trump's severed head. OXON HILL, Md. (AP) — Ananya Vinay showed little emotion as she plowed through word after mystifying word in the final rounds of the Scripps National Spelling Bee. Later, as she stood beside the confetti-covered stage, the newly crowned champion flashed a toothy grin as she inadvertently revealed how much confidence she'd brought to the competition. OXON HILL, Md. (AP) — Ananya Vinay never looked all that impressed by any of the words she was given in the finals of the Scripps National Spelling Bee. The 12-year-old from Fresno, California, showed little emotion and didn't take much time as she plowed through word after word. Sometimes she would blurt out questions, with little intonation — "Part of speech?" ''Language of origin?" — and sometimes she didn't even bother. OXON HILL, Md. (AP) — The Scripps National Spelling Bee proves every year that word knowledge is personal and idiosyncratic. Words that baffle most of the audience are considered easy by elite spellers. And spellers get tripped up by words that many older people come across frequently. Here are some memorable words from Thursday's final rounds of the bee. This guy knows his ABC's. Thomas York, a 14-year-old eighth-grader at St. Francis of Assissi School will be representing Rochester at the 90th Scripps National Spelling Bee in suburban Washington. He was the only Minnesotan to advance from the written spelling and vocabulary test, on which contestants needed a score of at least 29 to be one of 40 to advance tonight. Twelve-year-old Ananya Vinay has won the 90th Scripps National Spelling Bee. The sixth-grader from Fresno, California, won by spelling "marocain," a French word for dress fabric made of ribbed crepe. She gets more than $40,000 in cash and prizes. Runner-up Rohan Rajeev missed the word "marram," a Scandinavian-derived word for beach grass. 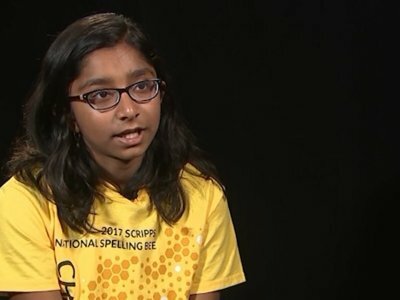 Shruthika Padhy, the 11-year-old Cherry Hill girl competing in her second Scripps National Spelling Bee, finished in seventh place during the televised finals Thursday night on ESPN. At 9:44 p.m., she faltered on the word quintain, defined as &ldquo;a post with a crosspiece having at one end a broad board and at the other end a sandbag&rdquo; (obviously! ), spelling it as quintin. WASHINGTON — Boerne’s Alex Iyer, the spelling whiz who went deep last year in the Scripps National Spelling Bee, has made it into tonight’s finals after making it through seven rounds this morning. Iyer, 14, and 14 other finalists will be on stage in the ESPN national telecast, starting at 7:30 p.m.
During the sixth round of the 90th annual Spelling Bee today, Iyer, wearing a bright red shirt and jeans, extended his arms in excitement and breathed a sigh of relief when he heard his word: attentat. NATIONAL HARBOR, Maryland : Una VanWyns:berghe of Van Wert, Ohio, correctly spelled both her words in the Scripps National Spelling Bee on Wednesday, but she failed to advance to the final rounds today. Una, 13, spelled "regurgitant" in the morning round of oral spelling and "refulgence" in the afternoon round. OXON HILL, Md. (AP) — The Scripps National Spelling Bee weeded out the field to the truly elite spellers during Wednesday's grueling preliminary rounds. Each of the 291 spellers got the opportunity to spell two words on stage. Those who didn't misspell a word were then at the mercy of their score on a written spelling and vocabulary test that they took on Tuesday. Ultimately, the top 40 spellers advanced to Thursday's finals. SYCAMORE – In correctly spelling “ursine,” St. Mary Catholic School seventh-grader Magnus Keswani remained in beast mode this morning at the 2017 Scripps National Spelling Bee in Washington, D.C.
For those scoring at home along with us, ursine is defined as relating to or resembling bears. Magnus, 12, has come on strong on the national stage by advancing through a preliminary written test and then nailing ursine to make round 3. NATIONAL HARBOR, Maryland -- Una VanWynsberghe of Van Wert, Ohio, correctly spelled "regurgitant" on Wednesday morning during a preliminary round of the Scripps National Spelling Bee. Una, 13, advanced to the afternoon round of the bee, which began Wednesday with 291 young spellers. By noon, 30 spellers were eliminated for misspelling the words given them, with about 20 more kids waiting their turns.